This exercise is intended to add proprioceptive challenge to the Single Leg Toe Taps. To do this exercise you will need a mat and a soft ball. 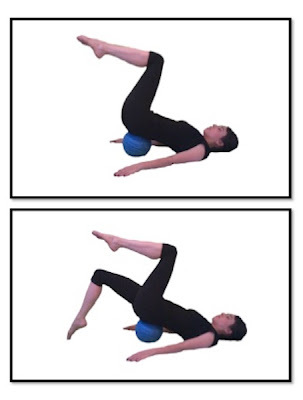 Start by lying on your back with the soft ball underneath your pelvis. Your legs will be in a tabletop position. Inhale to prepare and exhale as you lower one leg to tap the toe on the ground and return it to a tabletop position, then inhale in between and exhale again as you lower the other leg and bring it back up. Repeat 5-10 times alternating sides. The soft ball may make the pelvis a little wobbly, so to keep it stabile will require additional abdominal strength.